Own the worlds fastest Jet Today! !, What a Machine. 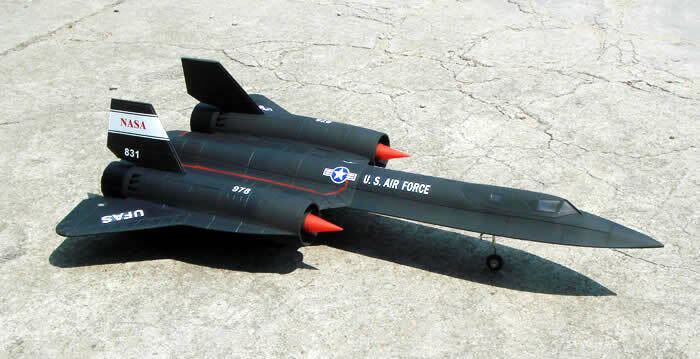 The SR-71 Blackbird is beautifully finished and well detailed twin EDF jet. not your typical foamie! Without a doubt this will be the pride and joy of your flying fleet. Comes with a powerful 3500kv twin EDF power system run by 2 30A ESCs. The SR-71 is 97% pre assembled, including all the servos and retract landing gears. Just glue the wings and vertical stabalizers and your ready to go! Review : Very Dissapionting. Kit is cheaply made out of crap foam material. Doesn't fly well on 4s 2200mah. maybe in a few years when batteries and edf are more powerful on smaller batteries. i tried to upgrade to bigger fans and battery, but got to heavy. It's such a shame, I love the Blackbird and was looking forward to having one of my own, but not this one. Would not recommend to anyone.